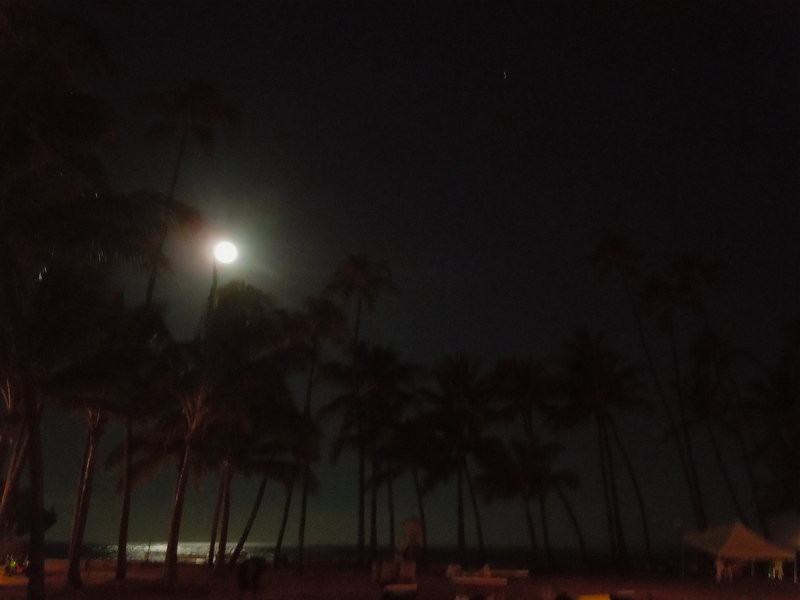 In the Hawaiian culture the Kahunas were priest, doctors and masters of black magic among other functions. They practiced their rituals in sacred areas called Heiaus. 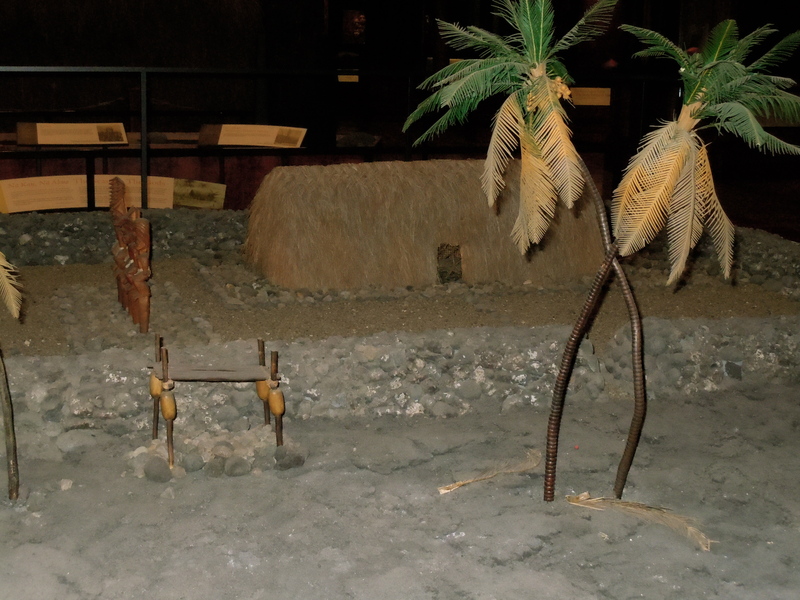 The last remaining vestige of the first Heiau constructed in ancient Hawaii can be seen at Bishop Museum. 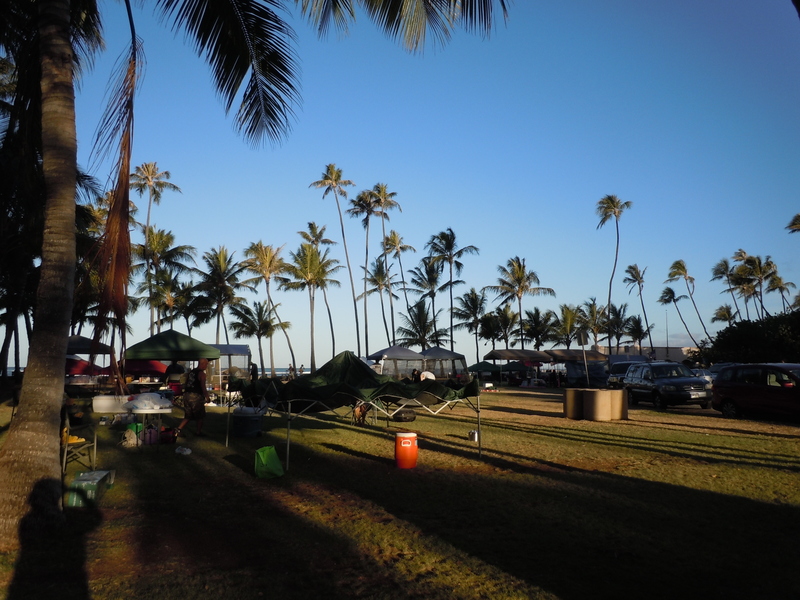 The heiau Waha Ula , or as it was known in ancient times, Ahaʻula, is a luakine. This was reserved for the High Chief and his god of war Ku. Among the rituals performed would be that of human sacrifice. 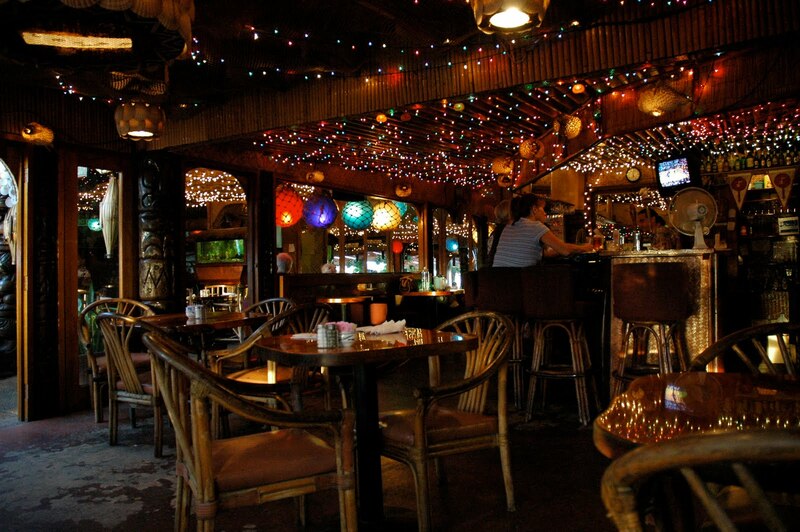 Two orders of kahuna would be, first, Ku and next Lono. Ku was the god of war. Every service performed to Ku was elaborate and exacting. The priest who served Ku would have to have an excellent memory as he would be performing elaborate rituals and long involved prayers. One mistake or misspoken word could mean disaster. 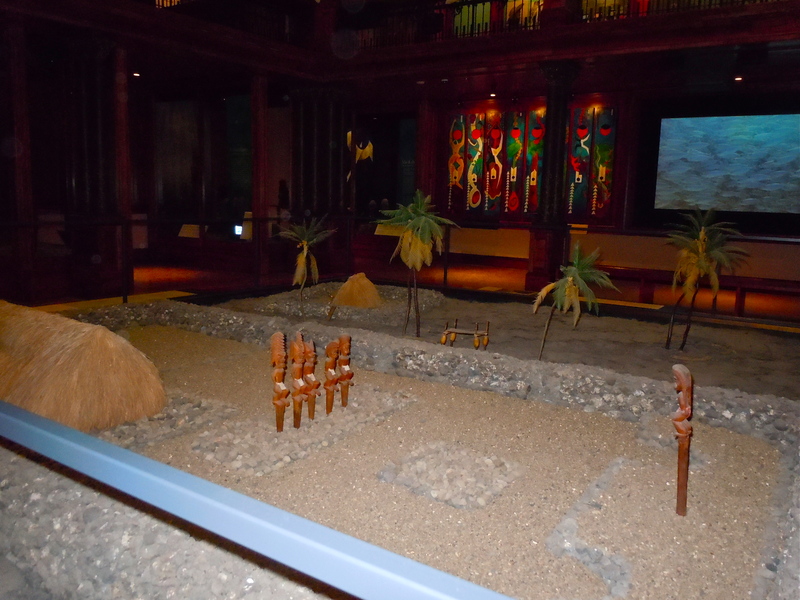 Lono was the god of agriculture and peace among other things. His kahuna, though performing long prayers and rituals, did not have the heavy responsibility of the god of war. 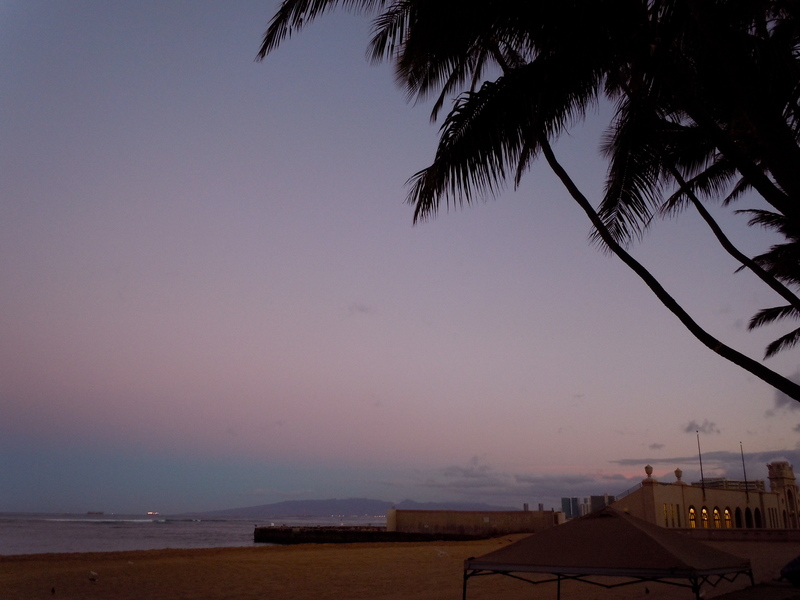 Waha Ula was used right up until 1819. 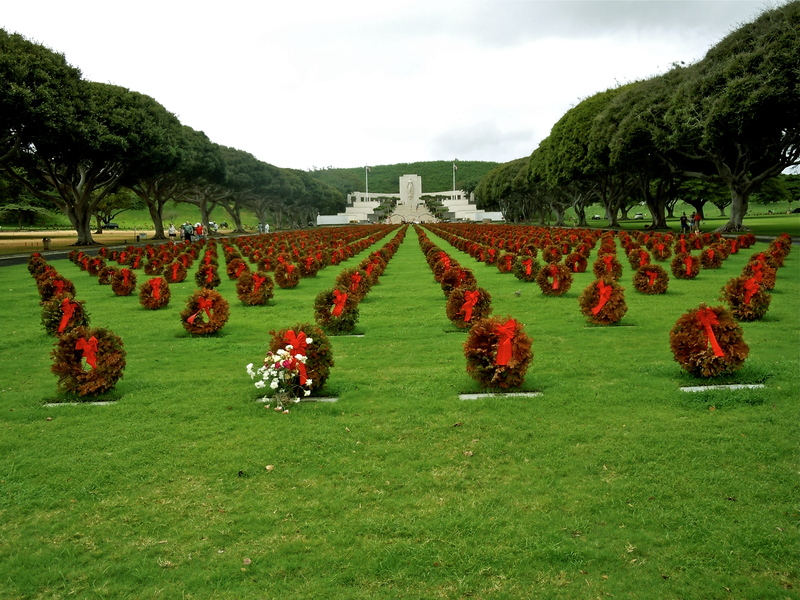 That year saw the ancient Kapu system (a system of laws) overthrown by Queen Kaahumanu. 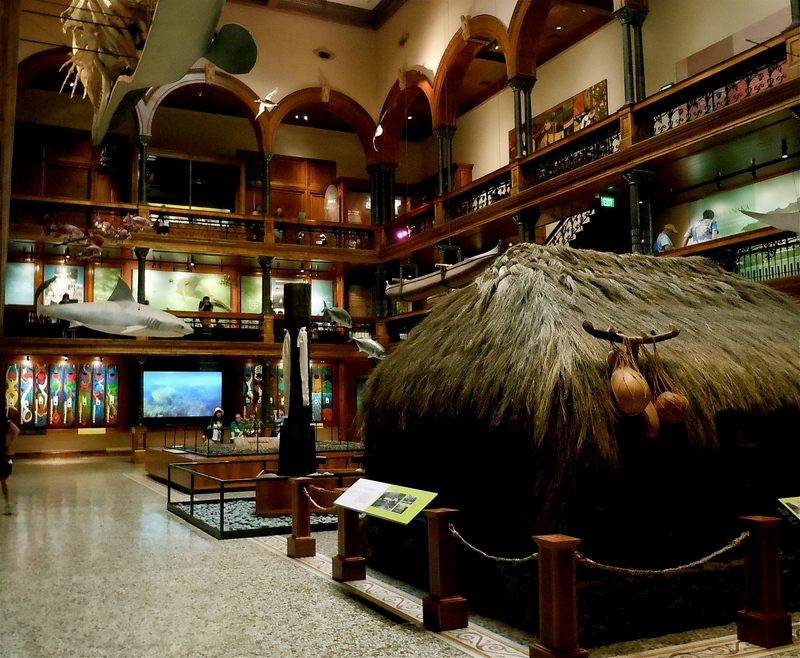 This replica of Waha Ula was as exact as the archeologist John Stokes could make in the year 1902. 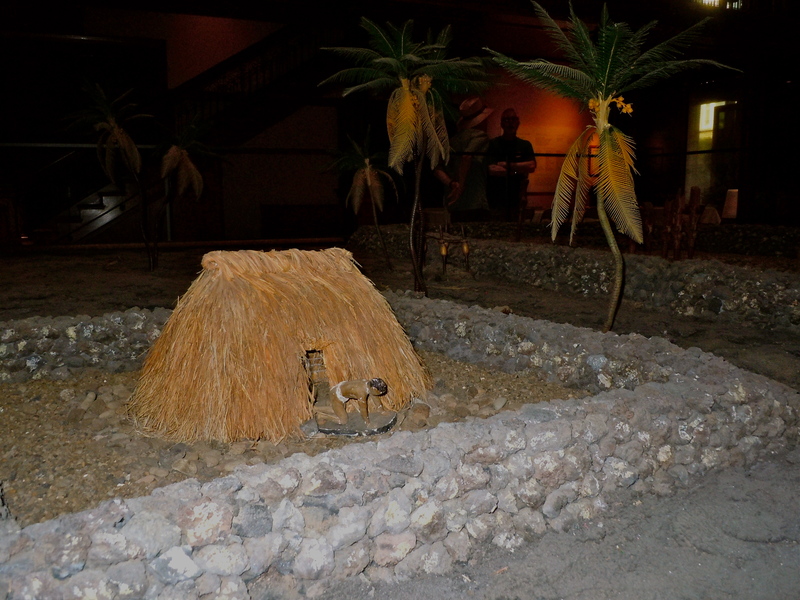 The actual stones from the heiau were put into this reproduction. 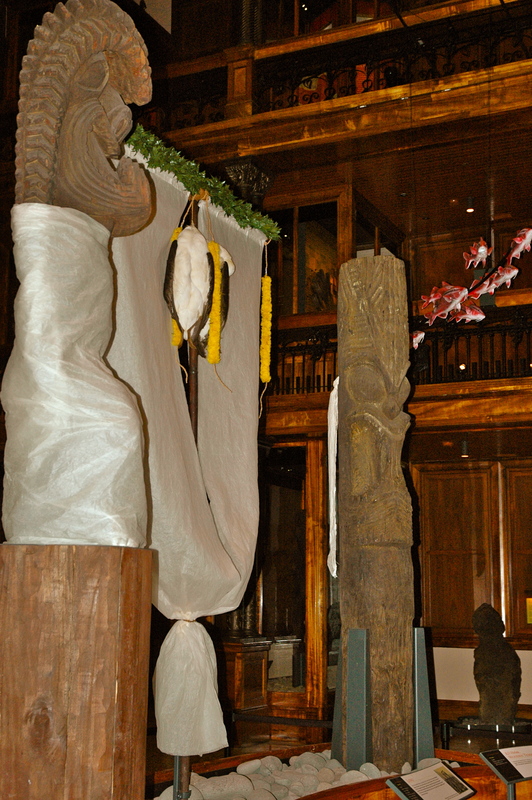 He placed the kiʻi or images as near as he could figure out according to what pieces of carvings were left in place. The hale or house to the right might have been where images were stored when not needed. Looking at images from the front. This hale would have been where the priest had slept. 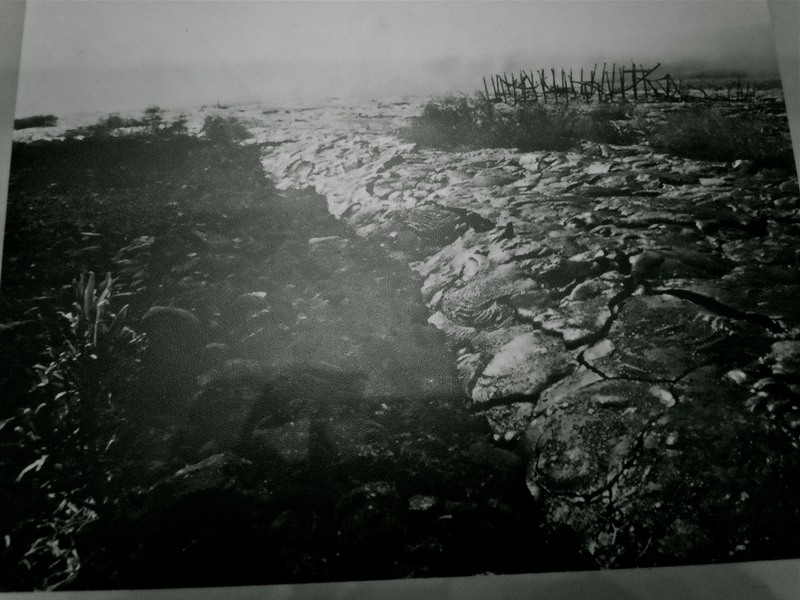 The photograph that is displayed with the exhibit shows the 1989 lava flow that had destroyed the visitors center at Waha Ula, but the heiau in front is still intact. 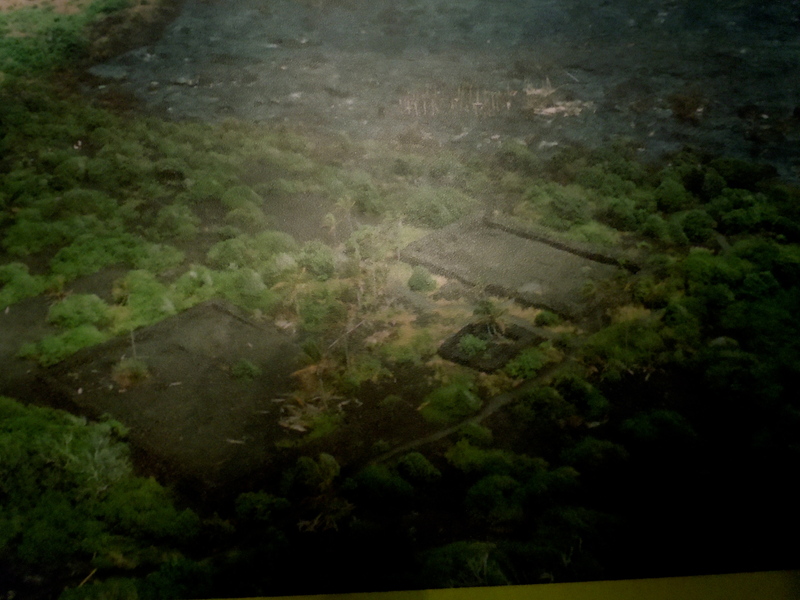 The 1997 lava flow completely destroyed everything making the replica at the Bishop Museum the only connection to that ancient temple. 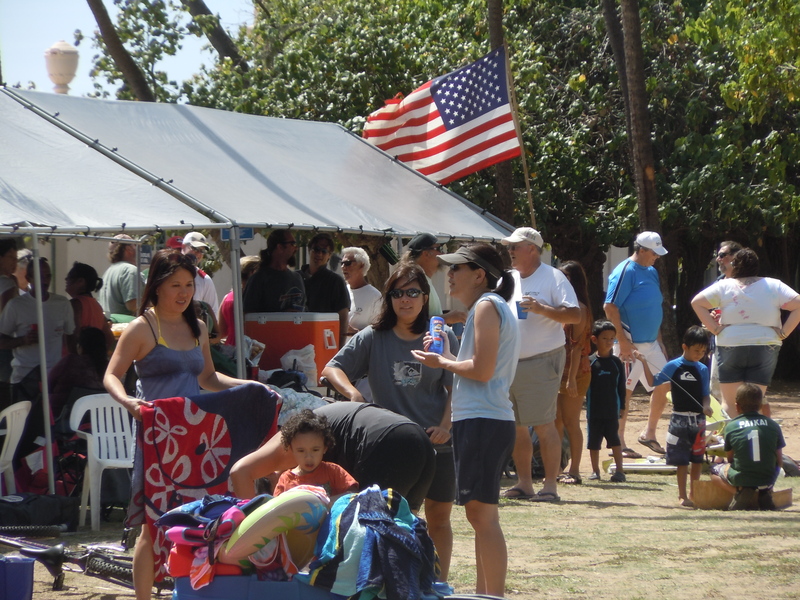 Every year my son has a 4th of July picnic in Waikiki. It is my favorite ritual. In order to get a decent spot he has in the past arrived the night before to save a place. I would join him around 5 AM so that I could, one, find parking and two, sit and drink coffee while the sun came up. It was a wonderful event. Last year he was told by the city that they were no longer allowing people to stay overnight and that you had to wait until 5 AM to get into the park. I did not know this but still planned on my 5 AM arrival. Well due to a new alarm clock that I was not sure how to set I kept waking up to make sure I had not over slept. By 2 AM I was exhausted and thought the heck with it I’ll just sleep and hope it would go off. Just as I drifted off Max decided he wanted to sleep on the bed and jumped up and plopped his furry body right in front of my face. He refused to get off the bed. After fighting with him for 20 minutes I finely got back to sleep but not for long as he started to bark at the person delivering the paper. It was now 3 AM and I gave up. I got up packed up all my things, made coffee, got ready and i was out the door at 3:30. 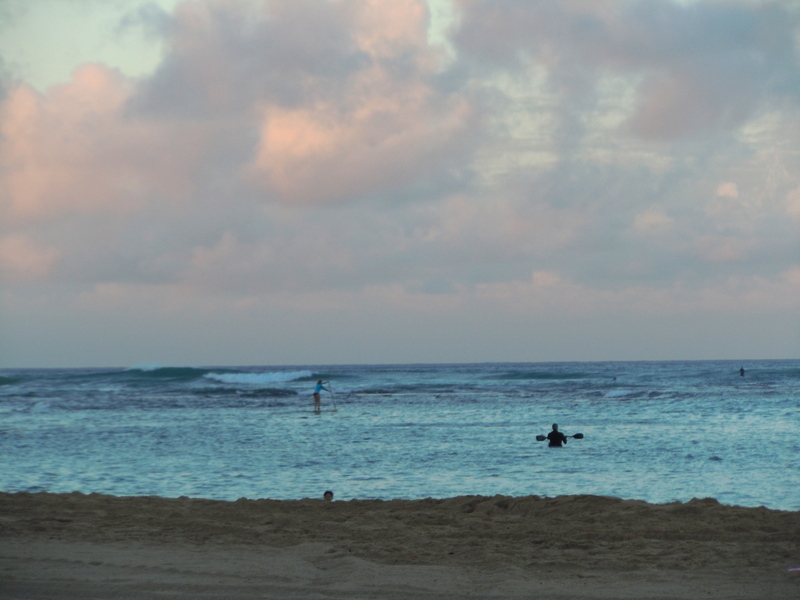 I was in Waikiki in 20 minutes. What would normally take 40 minutes during the day in regular traffic was a breeze on a holiday. And a good thing it was fast. 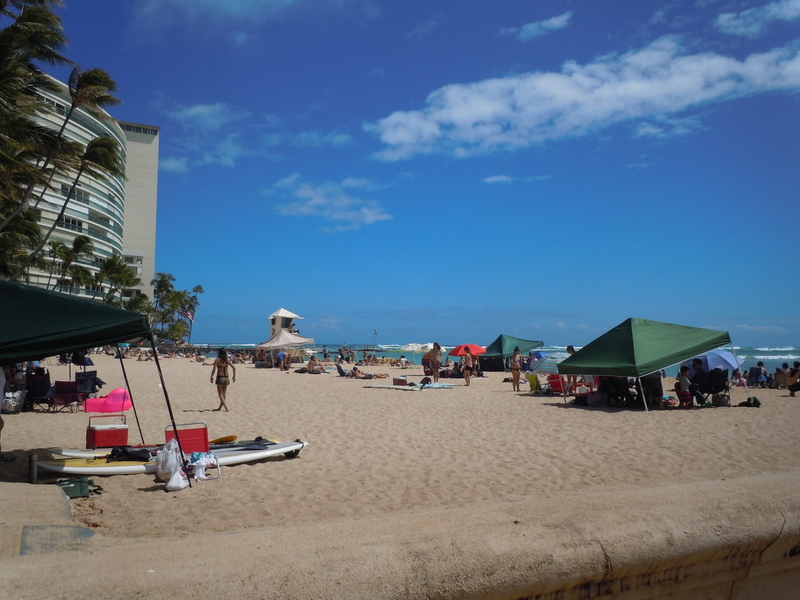 When I arrived there was not one parking space in the whole street along Waikiki beach. When I arrived at the park there were only 5 spaces left. Where I was always able to park right next to our spot, there were cars lining the area. What’s more I could not see my son. I drove way down from our usual space and took the first space I saw. 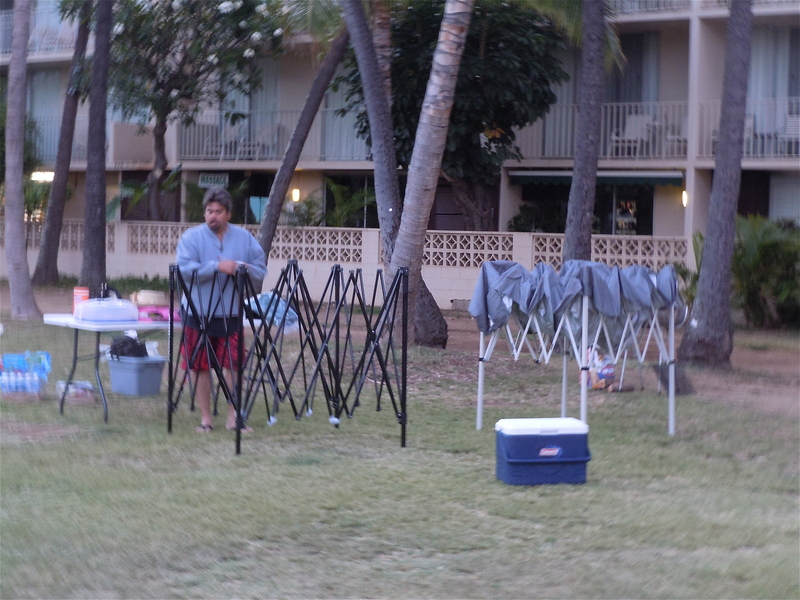 In the past there was never any tents set up. Now they were everywhere. The rule that only one person could sleep over and only in a sleeping bag to save a space had been totally ignored! I phoned my son, he was just driving down and I told him to hurry as the spaces were almost gone. He was upset when he arrived. People were sleeping everywhere. Four in the morning and you can just see tents set up to the right But at this time there are so many people down here that I don’t want to venture to the bench to drink coffee as I might stumble over someone. The Dawn is breaking and the only peaceful place is on the beach it’s self. 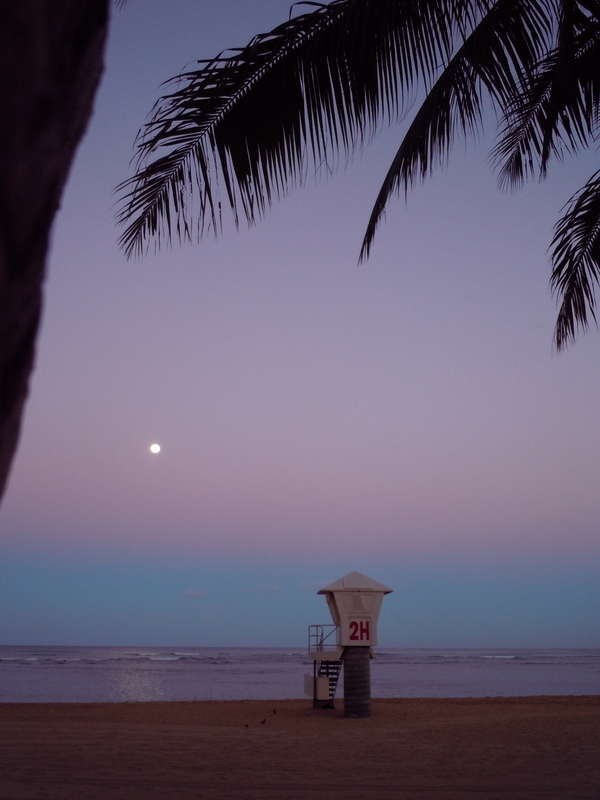 The lifeguard post is still quiet and unmanned. 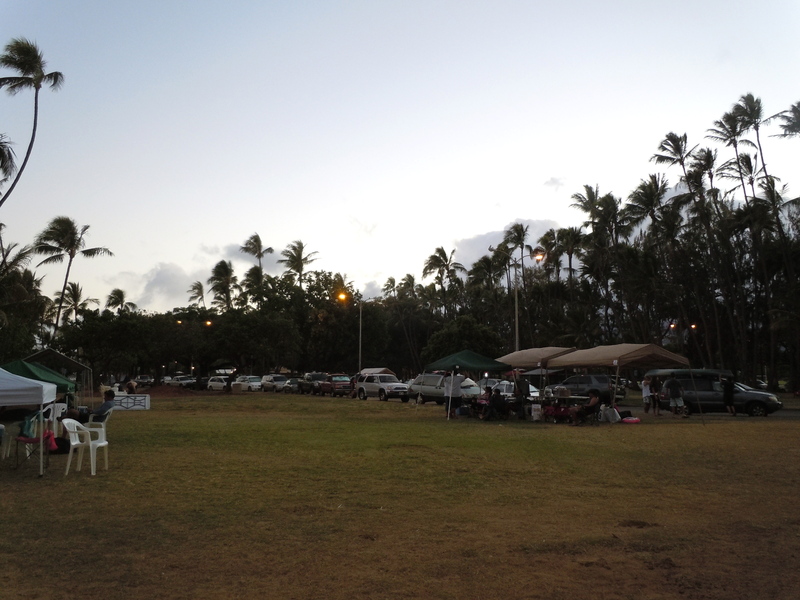 This is looking into the park and you are able to get an idea of how many people have arrived at the park. It is getting so crowded that there will soon be tents on tents. My son starts to set up. He and I are the only ones there at this time. He is a bit fuzzy from having put in a full day of construction the day before and was up a 3 AM to start loading and getting ice. He was not able to get the spot he usually got as there were already three tents set up there.The photo is a bit fuzzy because, well, I was a bit fuzzy too. 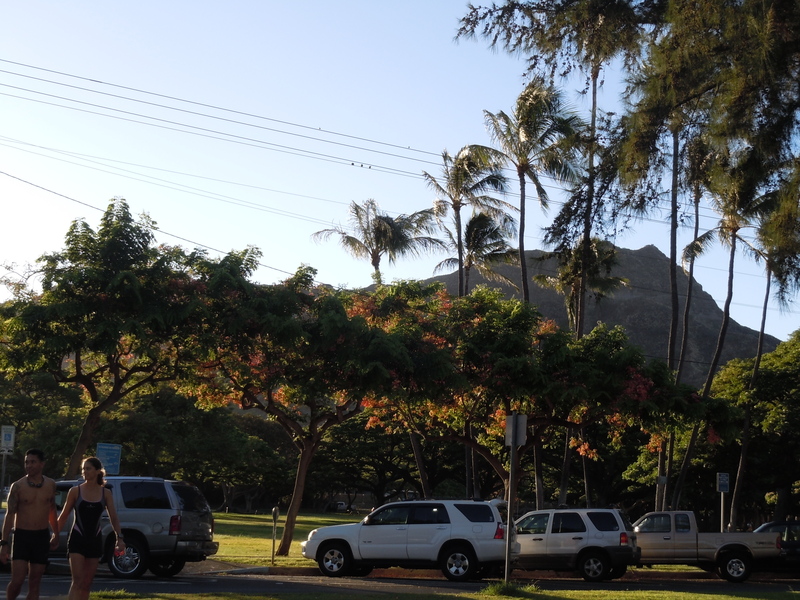 You can see all the cars parked along the park. I was parked way past those cars getting one of the last few stalls left. 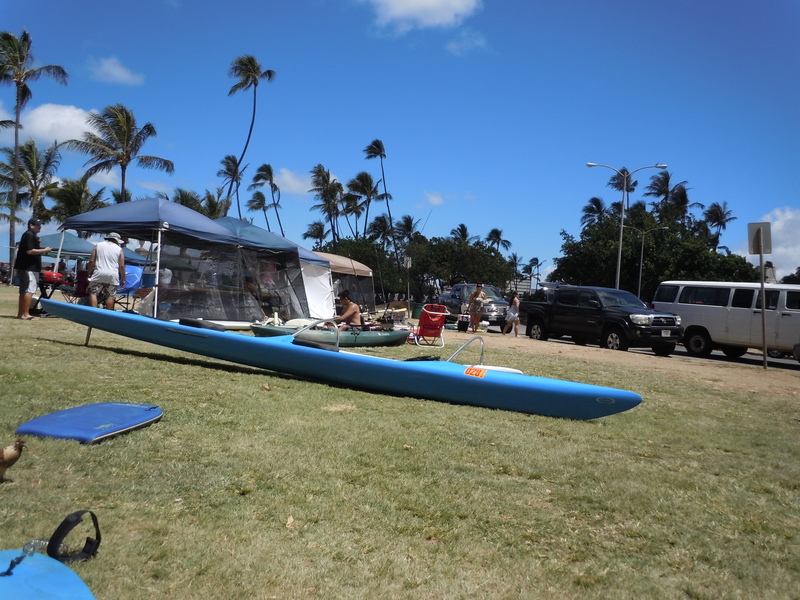 This canoe appeared early in the AM and sat for hours right in the middle of the only place left for kids to play. When we inquired as to who it belonged to, nobody laid claim. So we put it on the side and the kids got on with their day. I’m not sure if this guy didn’t want to deal with the crowds on the beach that were now gathering or he couldn’t swim. 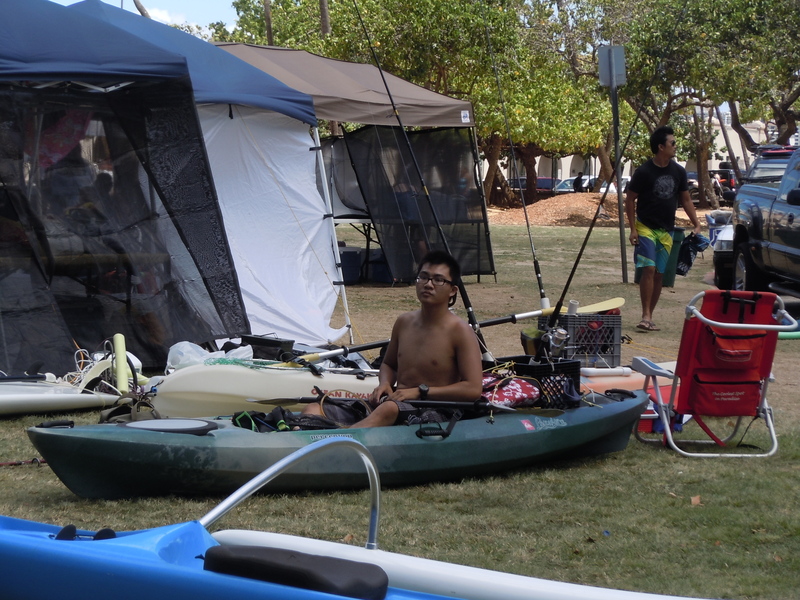 I guess he was practicing as he and the boat soon disappeared. This was a party of Marines who had a huge elaborate set up down from us. I found this surprising as the military has private access to some of the best beaches on the island. Nice beaches for locals are so overcrowded I find it hard to understand why they would want to set up and fight the crowds on this beach. 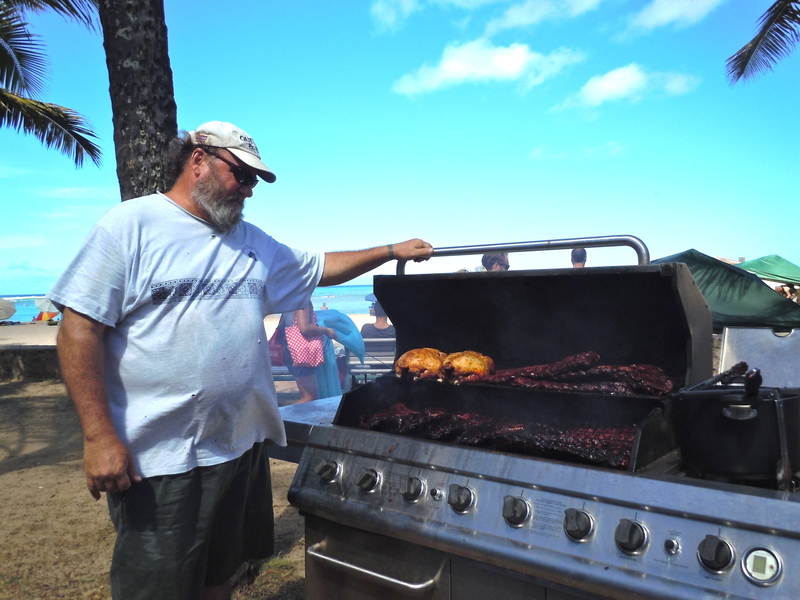 And this was the “Chef.” Boy did his ribs look good. And those are two chickens he has in there also. I asked him how in the world did he get that huge set up down there. Of course he pointed to all the strong Marines standing by waiting. They really know how to party. 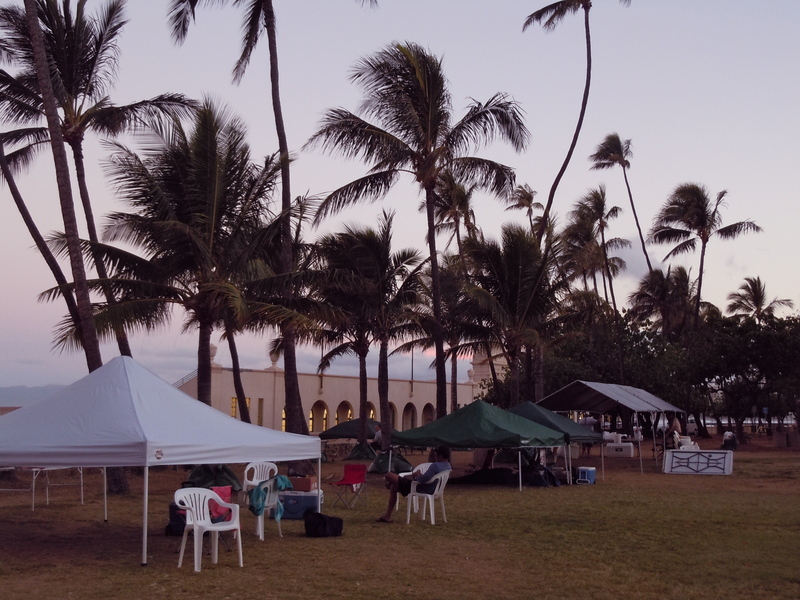 As the day got brighter and more and more people arrived, illegal tents with BBQ’s started to take over the beach. And it was still before 9 AM! My son and I looked around, both of us tired. I had not enjoyed my coffee ritual and we were crowded in between too many tents with strangers kids wandering into our area. What there was of it. Our families arrived and started to settle in. I looked at all the tents around us. There were a few of the older families that once had picnicked here. It was more younger people and military. 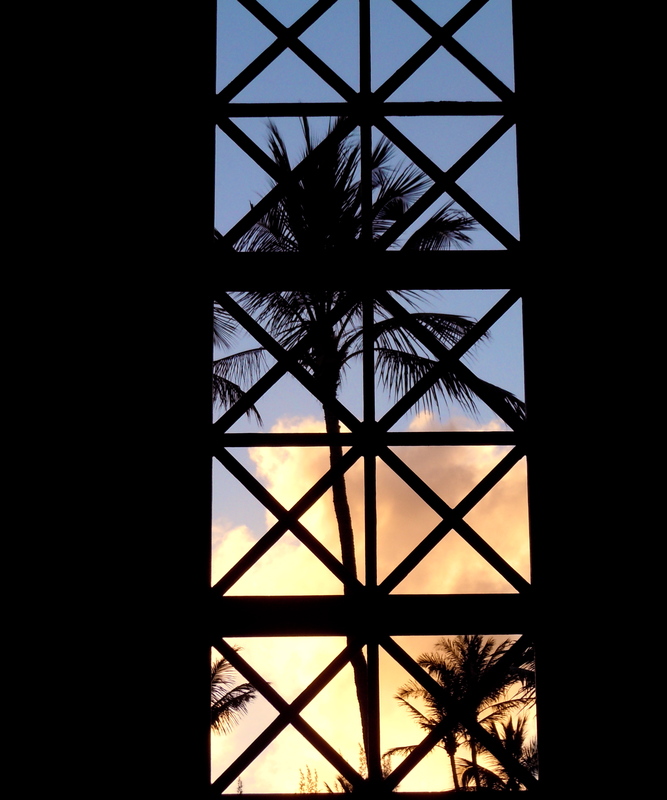 Things were again changing in these islands. I told my son that I don’t think I will be coming again. If I had not been harassed by Max and left the house so early I would not have found parking. The thought of getting up at that hour next year just to get a space no longer held any charm to me. I am sorry for the local families that are slowly loosing all their wonderful picnic areas. Yes indeed. We can kiss paradise good-by.